New York City has agreed to pay $2 million to settle a lawsuit filed by the family of Tamon Robinson, a 27-year-old who died after a 2012 collision with a cop car. According to the NYPD officers involved in the incident, Robinson ran into their stopped cruiser after they caught him stealing paving stones from a Canarsie housing project, causing him to fall backwards and suffer a fatal head injury. Witnesses had a more plausible-seeming account of what happened: The police ran over Robinson as they were chasing him. 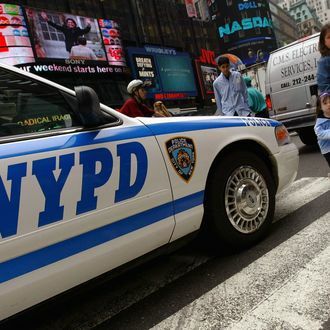 Either way, the NYPD sent Robinson’s mother, Laverne Dobbinson, a $710 bill for the damage her dead son’s body did to their vehicle, though they later made the tasteful decision to retract the charge. “We believe this is a fair and reasonable settlement,” said a Law Department spokesperson, of the $2 million payout. However, a lawyer for Dobbinson, Scott Rynecki, reminded the New York Daily News that the family still wants to see the cops face criminal charges in Robinson’s death. “More important to this family than the settlement is to see these police officers held criminally accountable,” he said. Dobbinson herself added, “I want these officers dealt with, they killed my son.” Former Brooklyn District Attorney Charles Hynes opened an investigation into the crash shortly after it happened, but, so far, the inquiry hasn’t led to any consequences for the NYPD.